Chances are, you are reading this with both hands gripping a mug of coffee. 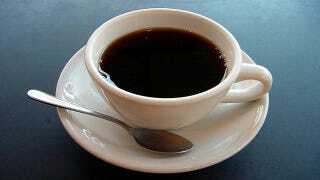 Whether that coffee has caffeine in it or not depends on whether it's the morning or the afternoon. But how does the caffeine get stripped away from a caffeinated bean? Find out. Caffeine, on its own, is an off-white powdery substance with an intensely bitter taste. It's the reason why beginning coffee drinkers load their cups with sugar and cream instead of doing the smart thing and throwing the cup and its contents out the window and slapping the person who gave it to them. There have been many methods of getting that nasty usefulness out of coffee, starting in 1905, when benzene was used to lift the caffeine away entirely. Benzene turned out to be a wee bit too toxic for food. Ethyl acetate was used in the eighties and nineties, and does much the same. It's also toxic, but it's present - to some degree - in ripening fruit, and so it was considered natural. If your brand of coffee, during the end of the last century, claimed that it was 'naturally decaffeinated,' that's what it had soaked through it. Now, with people getting ever more prickly about toxic chemicals being deliberately applied to their drug of choice, things have changed. Water, carbon dioxide, and activated carbon, dredge the caffeine out of coffee. Green, unroasted beans are either soaked or steamed in water. The water grabs the caffeine and lifts it out of the beans. This method wasn't used historically because, along with the caffeine, nearly everything that gives coffee its taste is lifted out as well. The water is then strained through 'activated carbon.' Activated carbon is charcoal that has been exposed to pressurized oxygen in order to riddle it with tiny holes, making it like a sponge. Although water is not picky about the elements that it scoops away, activated carbon grabs on to caffeine, but leaves other components alone. The activated carbon lifts the caffeine from the water. The water is then sent back to soak the beans, letting them re-absorb the chemicals and flavor that they lost. In other methods, carbon dioxide gas, or carbonated water, are also used. These methods grab the caffeine quick and get it out of the beans. The gas or carbonated water is then cleaned with activated carbon fibers, and reused. No matter what the method, it still tastes nasty. Via Coffee Research, Frostburg.edu, Today I Found Out, and How Stuff Works twice.